Boxer shorts. We all wear them – or something like them – and we eventually stop noticing the comfort levels, functionality and other helpful features in everyday wear. That is until we wear them to go on a hike. 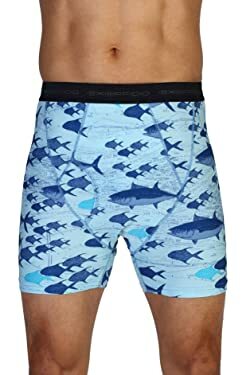 If, like me, you finally said enough is enough with these gross, clingy boxers, you will want to look at an alternative approach to hiking briefs. The ExOfficio Men’s Give-N-Go Boxer Brief is designed to be the best hiking underwear around and it is certainly the best that I have experienced so far. Search For ExOfficio Boxers On Amazon! Aren’t these hiking boxers just a basic pair of underwear? What is so special about them? To a degree these briefs are a lot like your average pair of underwear, in that they are made from familiar materials and shapes. You don’t have to worry about any strange NASA-made materials or odd structural supports here. There are made from 94% nylon and 6% lycra, which you will find on the labels of most of the briefs in your underwear draw, there is a three inch in-seam and they pretty much look like a normal pair of figure-hugging boxer-briefs. What makes them the best hiking underwear as far as I am concerned is that they have provided so much more comfort on hiking trips with additional practical benefits. The ExOfficio Give-N-Go is the ideal pair of hiking briefs for staying comfortable on a long trek. There are two features to these boxers that really make them stand out as alternative, hiker-friendly underwear options: they have moisture wicking technology, which stops them from getting all damp and clingy on a hot day, and they have an Aegis Microbe shield to control bacteria. To say that the sweat vanishes may sound a little extreme, but I certainly stopped noticing it. Not only does this ensure that your underwear is a lot less smelly at the end of the day, it makes them a lot more comfortable. This is apparently aided by the use of a diamond weave mesh fabric, but you have to be up pretty close to notice that. It was also noticeable just how soft these boxers were compared to some of cheaper pairs of underwear that lie near the back of my drawer. These antimicrobial hiking boxers are also pretty easy to clean! Did you just see your girlfriend’s ears prick up as you read that line? Ease of cleaning may not be high on your list of priorities when choosing underwear to go hiking in, but it was one of the first things that my girlfriend pointed out when I was browsing through the options online. She said, and I quote, “the worst part of you going hiking for a week isn’t you leaving me, its when you return and I’m left with your dirty, sweaty laundry”. It’s hard to argue there isn’t it. The beauty of these high-end hiking briefs is that they have a quick drying material, as well as that moisture and bacteria protection. It is so easy to give them a quick rinse in the stream, ring them out and leave them to dry in the sun. This also means that we can reuse a pair – legitimately this time – and cut down the amount that we need to pack. These ExOfficio Men’s Give-N-Go hiking boxers also offer functionality. Functionality is an odd thing to write about with a pair of boxer shorts, I mean, how much do they really do? The reason I mention this is because with all the special features that have been included to help them comfortable and hiker-friendly, you may worry that the designers have forgotten about the basics. Do they keep us supported and comfortable, do they stay up properly and do they offer adequate access? From my own personal experience, I can say yes to all three. I certainly felt that there was enough support for my own needs (obviously a can’t speak for all of you that are a little more blessed) and I have never had any concerns about the fit or security. The shorts have a terry elastic back for a snug fit around the waist and there is a functional fly on the front for when nature calls. Some wearers have said that they ride up on the thighs. I did notice this a little, but not so much that I felt that uncomfortable. Last, but not least, these ExOfficio men’s briefs for hikers are also pretty stylish. Does style really matter when you are choosing a pair of boxers to go hiking in? Well, that depends upon the people you are sharing a tent with. If you are heading off on a solo expedition then you can wear anything you want. There are some great patterns available in these hiking boxer shorts that can really appeal to the intrepid traveller in all of us – such as the yurt print that I was rocking last week on the local trails and the maps. The only problem is that some of these bold patterns might scare off the patient partner that has to sleep next to you each night and deal with the sight of you as they wake up in the morning. You don’t want her screams to rouse the local bears. The great thing about these ideal hiker’s boxers is that they come in a range of colours and prints to suit you and your partner, including some plainer black, charcoal and blue options. The pros and cons of these ExOfficio Men’s Give-N-Go Boxer Briefs. The final verdict: why are these ExOfficio Give-N-Go Briefs considered the best hiking underwear and are they worth so much money? You will have to take a deep breath before clicking the buy button here because these ExOfficio hiking boxers are not the cheapest pair in the world. The thing is that when you wear them, it feels that they were worth every penny. Choose a design that lets you express yourself as an avid trekker and enjoy the whole new level of comfort that you will experience without all that clingy material, sweat and odour to deal with. After a week in these ultimate hiking briefs, you wont be able to wear anything else. These briefs will change the way you think about hiking underwear for the rest of your life! Hikers can take long jaunts as well as shorter & quicker day hikes. They can be long, hard, go along strenuous trails and challenging your body’s capabilities to the core. Or they can be a spiritually reinvigorating experience, taking you along meadows and a number of forgiving hills. Either way, the proper gear makes all the difference, from the inside out. Thermal underwear is a bare necessity that protects the body from chills in the winter by providing an insulated layer of warmth. Here’s how it works. The fabric wicks moisture from the skin to create warm air flow among the many layers of clothing. Wearing thermal drawers can protect against hypothermia and frost bite in extreme cases. Usually, it is made to be thin, by design, so that it fits comfortably beneath clothing. Hikers who enjoy camping during winter should strongly consider wearing thermal underpants underneath their clothing. Another good tip is to always have some thermal hiking underwear handy in your car, especially in the winter months. The idea is that if your car breaks down and the temperatures drop, you will have some support to maintain your body temperature. Thermal underwear is organized by the type of material from which it is made. It is either cotton or a wool blend, typically. For the most part, thermal undergarments are available in basic neutral colors and sold in pairs. Many people in colder climates will wear thermal underwear instead of regular pajamas to stay comfortable and warm at night. Most people probably think of the long-sleeved shirt and long pants when they think of thermal boxers. The major drawback is for women who are wearing dress attire, such as silk blouses or skirts and dresses. Traditional thermal undergarments would limit the attire. There are style for children as well. Fortunately, many designers have begun transforming the traditional thermal underwear styles to suit a variety of different wardrobe needs. That means short-sleeved and sleeveless styles of thermal boxers are now available. The short-sleeve styles appear just like a normal t-shirt, but it fits snugly against the body. For people suffering the eternally cold workplace, thermal underwear is the answer to staying warm while maintaining a professional look. It is great if you want to go with a short-sleeved look or skip any sloppier bu traditionally warmer looks. In addition, it means you can skip wearing long-sleeved shirts and blazers or jackets if you choose. Several sleeveless styles exist, including tank tops or camisoles. They are easy to slip on to wear underneath any type of wardrobe. Men can wear the short-sleeved styles under their casual dress shirts. Loading up on various styles of thermal underwear makes for greater variety in the overlayers that people can wear. Let’s get back on the hiking trail here. One now perennial favorite for thermal hiking underwear is merino wool. If you are used to hiking in cotton t-shirts or another cotton, when you sweat discomfort takes over and you might not enjoy the resulting scent either. Cotton fabric offers supreme comfort, but it gets wet fast and takes a long time to dry. That is not an ideal combination for hiking, where you will inherently be out on the trails or off the beaten path for a while. Merino wool is a great layering material that breathes. That means that it lets you breathe in the hot summer months while keeping you warm during the winter months. It is pretty comfortable too, which is a plus. Merino wool does not itch when you wear it. Merino wool is nice and soft, durable, lightweight and comfortable to wear. The other advantage of Merino wool is that the fabric does not absorb moisture. Instead, it actually wicks the moisture away from the body. In other words, it will not be sopping wet like cotton becomes. Merino wool also dries quickly when compared to cotton, which is a huge advantage. It also means Merino wool resists body odor. If you are like many hikers and campers, you need to be able to keep the pack lighter, and wear your clothes multiple times. For the same reasons, wool hiking socks are a favorite. They do cost more money but may prevent blisters and other foot discomfort that go hand-in-hand with going the distance. Also consider polypropylene fabrics when taking to the hiking trails. Such fabrics are available over in the workout section. Consider buying a few different varieties of socks and try them out before going on a days-long excursion. That way you can prevent foot problems, instead relying on your new favorite socks. Both will wick moisture away and also dry very quickly. Fortunately, they do absorb body odors well. The same goes for underwear. You do not have to wear Merino wool. You might like polyester fabric instead. Definitely do not wear cotton because it will quickly get soaked with sweat, making for a very uncomfortable trip. Look into checking out different brands of both polyester and Merino wool thermal underwear and socks. Try them out on and off the hiking trails, as they keep many people warm at work. Tank top and short-sleeve styles make thermal underpants work with many styles of work attire. An increasing number of people these days are becoming aware of how great it is to wear merino wool fabrics when hiking and backpacking. But what’s so great about it and what is it exactly? 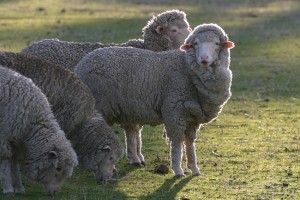 The following are some brief basics regarding merino wool and why so many individuals have fallen in love with the incredible fabric. Merino sheep is where merino wool comes from. The sheep are strictly raised for the high quality wool that they produce. The wool that they offer is the softest that is available. Merino sheep are bred in several different countries, however at this time the world’s best producers are probably in New Zealand. This fine quality wool outperforms a majority of other synthetic fabrics that mainly get used in athletic wear. Icebreaker is my favorite company that makes merino wool clothing. It not only produces incredible items of clothing, the company also is very ethical during each stage of the manufacturing process, starting with the sheep they use to the manufacturing process in addition to maintaining high standards of animal welfare. I not only love to wear the products made by this company, but I feel very good about purchasing them as well. I personally don’t have anything to do with Icebreaker, I just love the products that they make. I strongly recommend that you check them out if you haven’t ever invested before in any merino wool clothing. So why isn’t cotton any good for hiking? Also, why is merino wool among the best fabrics to wear for backpacking? Let’s begin with cotton. Cotton is easy to care for, easy to wash as well as dry, is fairly durable and feels create. However, cotton can be your real enemy when it comes to hiking. All you have to do is ask my girlfriend. A couple of years ago she went on a backpacking trip and hiked up a mountain for a couple of hours wearing cotton briefs. It is really miserable to hike in wet underwear, and she really paid for it and vows to not make that mistake ever again. Cotton absorbs moisture. So sweat is absorbed and it remains wet. So as you are sweating while you are hiking, that wetness is absorbed by your cotton clothing and remains wet. It also doesn’t dry very quickly, and your body odors are absorbed as well. For those people who are around you, it isn’t very pleasant. If you wear cotton and it begins to absorb the moisture from your body, it can result in blistering (if you mistakenly wear cotton socks) or you may experience chafing in other areas of your body. On the other hand, merino wool is quite lightweight. It also does a great job at wicking moisture away. That is why it has become so popular to use in athletic wear and the reason why it is very sensible to hike while wearing a merino wool sweater. It might seem like a really strange concept to hike in wool but since it wicks moisture away the fabric doesn’t cause you to over heat the way other fabrics may. It also doesn’t absorb odors the way that cotton does. That is an excellent feature to have if you need to wear any of your hiking clothing more than one time. It is also easy to care for this kind of wool. I personally wash all of my merino wool clothes in cold water and then hang them up to dry. You should look to invest in your first merino wool hiking clothing if you haven’t done so already. Just because it happens to be wet and cold or maybe even snowing, doesn’t necessarily mean that you need to put a hold on your hiking. Winter hiking can be quite invigorating and a lot of fun. However, there are some important things that are important for you to now. The following are some secrets about winter hiking that can help you stay safe an still have a lot of fun. The sport of hiking is given an entire new meaning by winter hiking. Trails you are quite familiar with during warmer weather take on an entirely new look during the winter. Those same trails may pose new challenges and be completely different. However, when venturing out to go on a winter hike, it is important to be smart about it. It is very important for you to be prepared. The hike could even be dangerous if you fail to adequate prepare for it. When it comes to winter, the very first thing that you need to know about it is that it can quite quickly and dramatically. You need to be sure to dress in a way that keeps you dry and warm. Your clothing should also be layered. That way if your level of activity decreases or increases, or the weather changes, you will either be able to add clothing or peel some of it off. Start out with high quality thermal underwear. That’s a good first layer since it helps with sweating. It is important for your hiking underwear to be made out of a material that wicks (or draws moisture out of your skin). For example, cotton doesn’t wick well; it retains moisture and can cause you to get chilled. Make sure your thermal underwear is made from wool blends or a synthetic material. You will want your next layer to help with retaining your body heat and insulating your body. The best kinds of materials for that are fleece, down or wool. The outer layer that you wear needs to be water proof in addition to insulating you. Be sure to avoid water resistant products. In general they aren’t as good at preventing water from getting in as the ones that labeled water proof. One good product that has been designed for being water proof is gortex. You body loses a lot of warmth through the head. Make sure that you wear some kind of protection for your head the covers the ears and head properly. Be sure that the head protection is water proof and insulated. On the opposite end of the spectrum, be sure to wear thick socks with wicking characteristics. Some blends that work well include Thorlow and Smartwool. Your hiking boots need to be waterproof also. The before you go on your hike, make sure your hiking boots are indoor so that when you put them on they are warm. Another thing that is very important is gloves, since having cold hands can be very distracting and uncomfortable. Many winter hikes also will layer their gloves. They wear a thin pair for insulation purposes and then also a second outside pair to offer additional protection from moisture and further warmth. Whenever you hike during the winter, it will cause your body to have to work harder to stay warm. That means you will be burning more calories. Therefore, it is important for you to eat additional energy food that is high in calories compared to when you go on a warm weather hike. Any time you are hiking, your top priority should always be hydration. Don’t get fooled into thinking you’ll need to drink less water simply because the sun isn’t beating down. Take lots of water with you. You will need to be sure that your water doesn’t freeze. You can buy specially designed hydrated packs which are insulated. The straws are even insulated as well. Some hikers being with water in their pack either hot or warm, realizing that once they go outside it will cool down. If there is going to snow on trail, keep in mind that the glare can be very intense on a winter hike. You need to be extra careful about protecting your eyes from harsh ultra violet sun rays to prevent yourself from getting “snow blindness.” Wear sunglasses sun protection factor ratings that are high. Also, make sure that any exposed skin from your face is protected using a sun screen with a high UV factor. Protect your lips as well. Depending on how severe the weather is and how long the hike is, it’s always a great idea to have safety items with you. Always make sure to have dry pairs of gloves and socks, cell phone, flashlight, hand warming packets, lighter, multi-tool or pocket knife, compass, first aid kit and trail map. That might appear to be an excessive amount of precaution. However, for winter hiking it is very necessary. The rewards will be definitely well worth it when you catch glimpse of the trials in all of their majestic character and beauty. It is modest, hidden away most of the time. That is, unless you are a superhero, in which case, you wear your hiking underwear on the outside. Besides making yourself as comfortable as possible so that you can enjoy your hiking, mountaineering, biking, and camping excursion, good backpacking underwear might play other roles. Good outdoor underwear is integral to ensuring good hygiene while you are out hiking, whether you are spending weeks making your way through the Appalachian Trail, up Mount Everest, or just spending the day breaking free in the local wilderness. These days there is no reason to feel like a swamp monster dealing with an unsavory wetness or odors wafting from your body. Instead, you may need to wear your clothes multiple days and may not have the luxury to stop and wash them out too frequently. Good hiking underwear, therefore, wicks away moisture to keep you dry while providing a good base layer. It keeps you dry and helps heap on the heat for a nice warm air flow among the layers of clothing during cold months. In hot temperatures, the same fabric may provide a good bit of breathing room to keep you dry and odor free. It is easy to overlook underwear because it just simply is not as fun as new walking sticks, hiking poles, knapsacks, hiking packs, cooling hats, sunglasses, sleeping bags, or even a tent. In other words, there’s a world of equipment outdoor lovers put in the queue long before they consider buying good underwear. New hiking underwear these days may include antimicrobial properties to keep you fresh, smelling good, and free from illness. The material makes all the difference where hiking is concerned. It needs to keep you comfortable most of all. Make sure it will not rub you the wrong way or cause chafing. It needs to work with your body to maintain its natural temperature. Merino wool, lycra, and nylon are all great materials that maintain your normal temperature. They are all quick-drying, light, breathable, and comfortable. Merino wool is considered a good three-season material because it is great except for during the hottest days. If you are trekking through a desert during the hottest temperatures, then leave the Merino at home. When it is super hot out, opt for a light synthetic fabric for a better performance and more comfortable experience. Flatlock seams are excellent to maintain comfort with all that movement you will be doing when you go hiking. It prevents chafing. Antimicrobial properties cannot be emphasized enough. Always wear antimicrobial underwear when hiking because it will maintain its freshness for days at a time. Merino wool actually has these properties naturally. The other materials, such as polyester, are treated to make it have antimicrobial properties. Durability is very important for hiking because of all the movement, and the excess demand the wearer will put on the underwear while hiking. It is worth making the extra investment to get good hiking underwear. 1.1 Aren’t these hiking boxers just a basic pair of underwear? What is so special about them? 1.2 The ExOfficio Give-N-Go is the ideal pair of hiking briefs for staying comfortable on a long trek. 1.3 These antimicrobial hiking boxers are also pretty easy to clean! 1.4 These ExOfficio Men’s Give-N-Go hiking boxers also offer functionality. 1.5 Last, but not least, these ExOfficio men’s briefs for hikers are also pretty stylish. 1.6 The pros and cons of these ExOfficio Men’s Give-N-Go Boxer Briefs. 1.9 The final verdict: why are these ExOfficio Give-N-Go Briefs considered the best hiking underwear and are they worth so much money?